It checks if you’ve a 32/64 bit Windows version (in the last case a DOS emulator is needed to run a DOS program, otherwise Windows itself is enough), and selects the best additions for you to install. At that point you just have to accept them or change them with your preferred choices and click OK -> Start, then DosPrint will automatically download, install and configure the programs you selected to run your DOS applications and/or print to the already installed Windows printers without having to manually download, install, and learn how to configure them (that usually would mean manually editing huge text files). 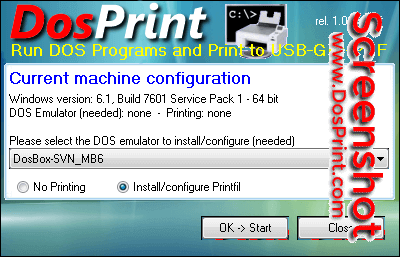 Yes, with a couple of clicks you can have DosPrint making all the job for you, and in a few minutes you’ll be ready to run your DOS programs and have them automatically printing to any printer that’s installed in the Windows Control Panel.